April 19, 2017 By Elizabeth Lindemann 9 Comments / This post may contain affiliate links. This Roasted Sweet Potato Hummus is so simple and so yummy. 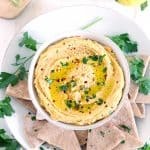 It’s a fairly traditional hummus recipe with roasted sweet potatoes added for extra nutrition and a slightly sweet, toasty flavor. It’s vegan, healthy, and packed full of deliciousness! I’ve been LOVING hummus lately. It packs such a nutritional punch and it’s so addictive, but I don’t feel bad about being addicted to it. I love store-bought hummus and admittedly eat it a lot, but making it yourself is a) so easy, and b) SO cheap, that it’s hard not to do. This recipe takes a bit more time than a traditional hummus, since you roast sweet potatoes first. But boy oh boy, it’s worth it. Sweet potatoes make this healthy snack even MORE healthy and nutrient-packed, and the flavor they add is phenomenal. You can use leftover roasted sweet potatoes if you’re making them for dinner, which may save you some time! 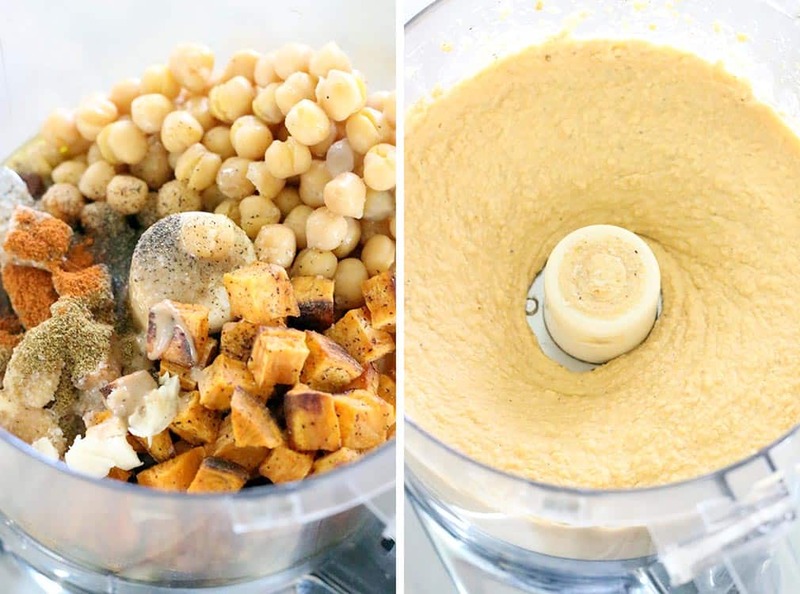 Making hummus involves nothing more than blending some ingredients together in your food processor or blender. 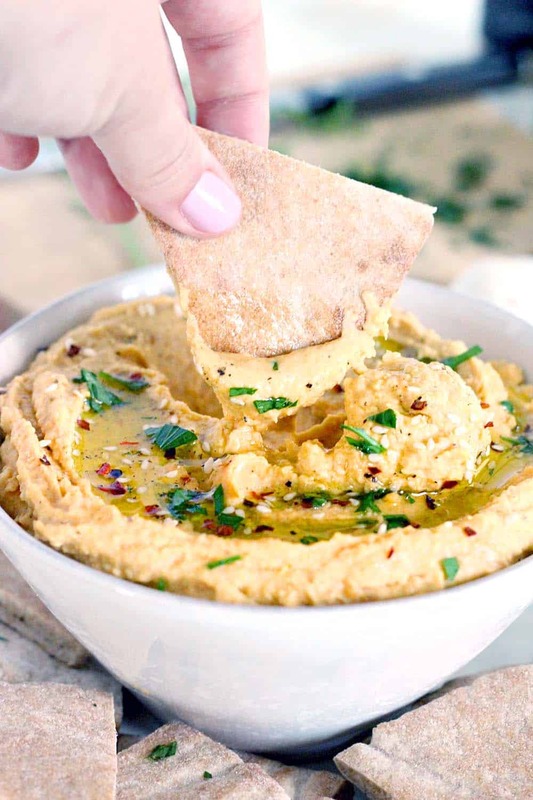 Some people take the skins off the chickpeas before using them- this creates a smoother, creamier hummus. 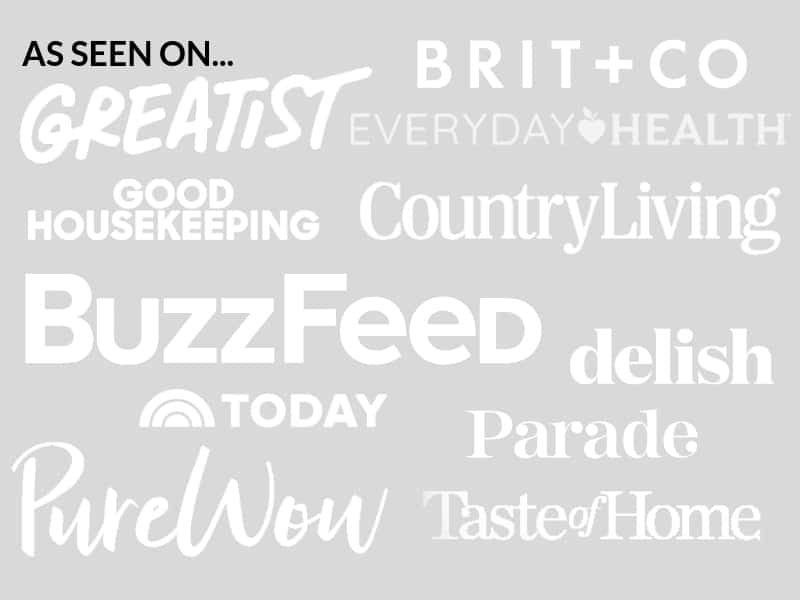 However, this is a blog about food for busy people, and as a busy person, I don’t have time for that. Blend the ingredients together thoroughly before adding liquid, then add the liquid gradually WHILE the food processor/blender is on. The chickpea liquid is thicker than water, and when added gradually, it helps emulsify the hummus. Blending the ingredients thoroughly before adding it ensures the solids are pulverized completely, making it smoother. It might not be *quite* as smooth as taking the skins off the chickpeas, but to me, this is just one of those things that isn’t worth the time or effort. I love hummus served with an extra drizzle of extra virgin olive oil on top. I also added sesame seeds for a little crunch, crushed red pepper for some heat, and minced fresh parsley to brighten it up a bit. 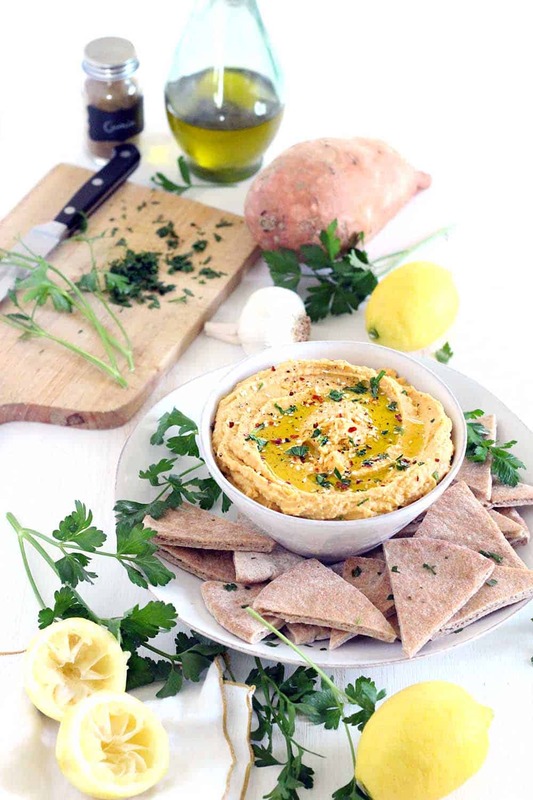 Hummus is usually served as a dip with pita bread or crudités. It’s also GREAT spread on sandwiches (I made a simple one this morning with cucumbers inside a pita pocket), or as a substitute for mayonnaise in chicken or tuna salad (like this curried chicken salad). You can even spread it on chicken before baking it, which creates a crusty outside and keeps the meat juicy. Love hummus as much as I do? This is my THIRD hummus recipe on the blog. 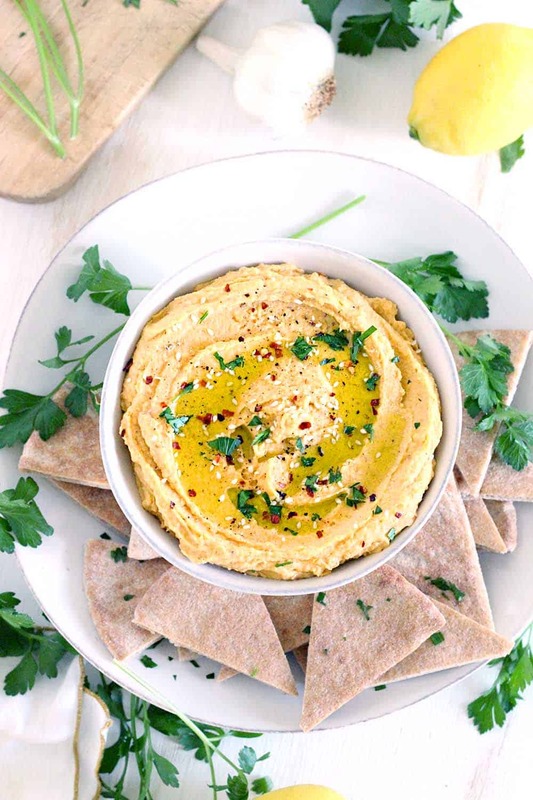 You should try this Sriracha Carrot Hummus and Roasted Garlic Hummus, too! Roasted sweet potatoes add a slightly sweet, toasty flavor to this otherwise traditional hummus recipe. A gluten-free, vegan snack that's great on sandwiches or served with pita bread or crudités. Toss the sweet potatoes with 1 tablespoon olive oil and salt/pepper to taste. Roast on a rimmed baking sheet at 425 degrees for 20 minutes, or until potatoes are tender and beginning to brown. Remove from oven and allow potatoes to cool. Add cooled potatoes, drained chickpeas, remaining 3 tablespoons olive oil, garlic, lemon zest and juice, tahini, salt/pepper, cumin, and cayenne pepper to food processor (or blender). Blend together until completely pulverized- about 2 minutes. While food processor is running, add reserved chickpea liquid 1/4 cup at a time, until hummus has reached desired consistency. Garnish with extra olive oil, sesame seeds, crushed red pepper, and/or minced fresh parsley, if desired. Serve spread on sandwiches, with pita bread or crudités, or as a substitute for mayo in chicken or tuna salad. Don't have tahini, or can't find it at your store? Substitute peanut butter or almond butter for it. Very tasty, nutritious, and colourful. My husband liked it too. I would make it again. Turned out great! Just a little different than traditional hummus…we really enjoyed it! My first time making hummus. I don’t have a food processor so I used my blender. I won’t be doing that again! Took way too long! Time to shop for a food processor! And no, you’ll never catch me peeling chick peas …or grapes!! So glad you liked it! And yes- definitely get a food processor! I use mine all the time- in fact, I don’t even own a blender, since I find the food processor works so much better for most things (and I’m not much of a smoothie person). That took 45 seconds after receiving your email to get off my sofa and search for a sweet potato in my vegetable bin! My sweet potato is roasting in the oven and I’m blending this together in 30 minutes. I’m giving this a 5-star rating in advance because I know it’ll be superb. Your recipes are healthful, easy and divine; your roast chicken remains the best I’ve had since I lived in Paris. Cheers! I can’t wait to see the new “beauty shots” of your famous roast chicken. It’s been the most recipe-requested and commented upon food shot I have on Yelp. The sweet potato hummus is fantastic. While I don’t make my food super-spicy because of my 9 year-old’s more sensitive palate, I did use the amount of cayenne you suggested & it is “just right.” The liquid from the can of garbanzo beans made it perfectly creamy; I added it slowly and ended up using the whole can. It’s an excellent tip when most recipes tell you to drain the beans & dispose of the canning water. And no, I would never peel garbanzo beans, either for (has to be marginally) creamier hummus. To those folks who do, God bless and PS I have some pots to wash if you’re bored!